(Springfield, IL) – Governor Pat Quinn’s budget proposal that slashes additional $4.1 million from Illinois child welfare agencies serving troubled Illinois teenagers will undermine care and after school programs for at least 17,000 children, according to advocates today who appeared at an Illinois Senate panel hearing. According to Berglind’s analysis of Quinn’s budget under the Illinois Department of Human Services, headed by Secretary Michelle Saddler, Early Intervention, Homeless Youth, Healthy Families, Parents Too Soon, Redeploy Illinois, Teen REACH, Teen Parent Services, and UDIS were reduced 10% this year and 20% in the last two state budgets. Berglind made her comments as the Illinois State Senate Humans Services Appropriations Committee today took budget testimony at its hearing from youth service advocates. Senate Committee members include: Chairman Donne Trotter (D), Jeff Schoenberg (D), Jacqueline Collins (D), William Delgado (D), Mattie Hunter (D), Mike Jacobs (D), Emil Jones, III (D), Matt Murphy (R), Pamela Althoff (R), Tim Bivins (R), Chris Lauzen (R), Dave Syverson (R). Additionally, Berglind noted that Illinois Department of Human Services officials said that 4,200 children would lose care due to Quinn’s cuts to Mental Health Community Based services. “Eliminating mental health care for 4,200 children will likely doom their academic performance,” said Berglind. Finally, Berglind noted that the state special education budget took a huge hit of almost $67 million in Quinn’s budget. In the budget, the Regular Orphanage Act line is down 25.44%, the Special Ed Orphanage Act line is down 32.13% and the Private Tuition Line is down 13.78%. “State support for special education is down, down, down the drain,” said Berglind. “We urge the General Assembly to develop a budget that reverses the massive cuts to care, after school, and special education programs for troubled youth,” said Berglind. (Springfield, IL) – The Child Care Association of Illinois today called on the Illinois House to approve an income tax increase. 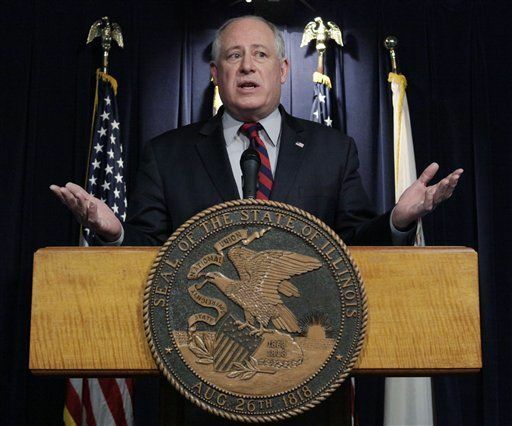 “If the House fails to approve an income tax increase, lawmakers must then vote for Governor Pat Quinn’s doomsday budget as a budget balancing alternative–and accept their complete abdication of responsibility,” said Berglind. The Doomsday Budget contains cuts, reductions and eliminations across all human services. If the income tax vote that is expected on Wednesday falls short, the House will probably vote on this doomsday budget on Thursday. “It would be a budgetary bloodbath,” said Berglind. At DCFS, if Quinn’s average 37% cut is applied across the board, its budget would end up at about $850 million—almost $500 million less than currently budgeted. Abused and neglected child caseloads for workers collide with court consent decrees, according to Berglind. On the DHS side, Community Health and Prevention Division would decrease from $237 million to $149 million—a loss of $88 million. Some of the budget lines are so small they could not absorb a 37% reduction and still be viable. The Chairs of the House and Senate Human Services Appropriations committee—State Representative Sara Feigenholtz and State Senator Donne Trotter—need to communicate to House Speaker Michael Madigan, House Minority Leader Tom Cross, Senate President John Cullerton, and Senate Minority Leader Christine Radogno that a state income tax increase must be approved. The legislature is scheduled to adjourn on May 31.